A collection of files for 3D printing demonstrating congenital heart defects. There are four STL files for 3D printing demonstrating a moderate secundum atrial septal defect (ASD) and a mild coarctation. An atrial septal defect is a birth defect of the heart in which there is a hole in the wall (septum) that divides the upper chambers of the heart (atria). A hole can vary in size and may close on its own or may require surgery. If one of these openings does not close, a hole is left, and it is called an atrial septal defect. The hole increases the amount of blood that flows through the lungs and over time, it may cause damage to the blood vessels in the lungs. Damage to the blood vessels in the lungs may cause problems in adulthood, such as high blood pressure in the lungs and heart failure. Other problems may include abnormal heartbeat, and increased risk of stroke. MRI obtained for evaluation of distal arch and pulmonary veins due to findings of pulmonary overcirculation out of proportion to typical ASD pathophysiology. The MRI provided a complete anatomic overview and quantified the right sided enlargement from the 2:1 shunt through the ASD. Due to saturation band nulling of blood returning through the right sided pulmonary veins, there was excellent definition of the ASD due to the "dark" blood mixing with the "bright" blood and outlining the borders of the ASD which transfers to the model very well. Please keep in mind, that the model represents a heart in end-systole rather than diastole. The available model has been validated to demonstrate the case’s pathologic features on a Z450 3D printer, (3DSystems, Circle Rock Hill, South Carolina)(or other printer as appropriate). While the mask applied to the original DICOM images accurately represents the anatomic features, some anatomic detail may be lost due to thin walled structures or inadequate supporting architecture; while other anatomic detail may be added due to similar limitations resulting in bleeding of modeling materials into small negative spaces. However, intracardiac structures, relationships, and pathologic features represent anatomic findings to scale and in high detail. The model is provided for distribution on Embodi3D with the permission of the author, pediatric cardiologist Dr. Matthew Bramlet, MD, and is part of the Congenital Heart Defects library. We thank Dr. Bramlet and all others who are working to help children with congenital heart problems lead normal and happy lives. It is distributed by Dr. Bramlet under the Creative Commons license Attribution-NonCommercial-NoDerivs. Please respect the terms of the licensing agreement. These congenital heart defect STL files demonstrate Partial Anomalous Pulmonary Venous Return (PAPVR). In PAPVR, one or two of the pulmonary veins returns blood to the right atrium instead of the left atrium. This causes oxygen-rich blood to flow back to the lungs instead of on to the rest of the body. Because some oxygen-rich blood is continually flowing between the lungs and the right atrium, the right chambers of the heart may become dilated. Over time, this may cause an abnormal heart rhythm (arrhythmia). In addition, too much blood flow to the lungs may increase the pressure in the lung's blood vessels, leading to a condition called pulmonary hypertension. If only one of the pulmonary veins is affected by the disorder, there may not be any symptoms. If two of the veins are affected, there may be shortness of breath during heavy exercise. Aortic coarctation is also present. Coarctation of the aorta is a narrowing of the aorta, the main blood vessel carrying oxygen-rich blood from the left ventricle of the heart to all of the organs of the body. Coarctation occurs most commonly in a short segment of the aorta just beyond where the arteries to the head and arms take off, as the aorta arches inferiorly toward the chest and abdomen. There are three STL files for 3D printing this model in slices. A whole model STL file is also available for 3D printing. Demonstrated is a bicuspid aortic valve and history of coarctation repair within the first week of life by end to end anastomosis. MRI obtained for evaluation of distal arch. • Mild residual narrowing of second transverse segment of the aortic arch. MRI images obtained at end-systole due to tachycardic heart rate during exam. RV End-systolic volume is 36.3 ml. LV End-systolic volume is 30.06 ml. A GE 1.5T HDxt system was used for the 3D HEART sequence which used a 3D respiratory-navigated balanced SSFP (steady state free precession) multi-slab sequence with T2 preparation that provides whole heart coverage with high contrast-to-noise ratio between vessels and myocardium. Due to the relatively fast heart rate of 122 bpm, the fat saturation was turned off to decrease the time needed for the prepatory pulse brining the acquisition window earlier into the cardiac cycle so that it could be centered on the quiescent stage of end systole. The sequence was run with the following parameters: TR 3.4, TE 1.4, Freq 224, Phase 160, RR 8, and fat sat off. The MRI identified previously un-diagnosed partial anomalous pulmonary venous return. However, the Qp:Qs fell within acceptable left to right shunting of < 1.5:1 and there was insignificant RV, RA enlargement. The MRI evaluation of the coarctation repair revealed a good repair with only mild narrowing, which appeared more severe by echo due to the post-stenotic dilation. This STL file is related to another set of files demonstrating the congenital heart defect double aortic arch. This heart STL file demonstrates double aortic arch blood pool. Double aortic arch is one of the 2 most common forms of vascular ring, a class of congenital anomalies of the aortic arch system in which the trachea and esophagus are completely encircled by connected segments of the aortic arch and its branches. Although the double aortic arch has various forms, the common defining feature is that both the left and right aortic arches are present. 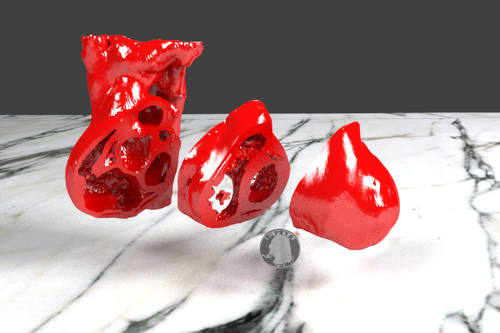 There is one STL file for 3D printing the whole congenital heart defect model double aortic arch with blood pool. Double aortic arch is a relatively rare congenital cardiovascular malformation. Double aortic arch is an anomaly of the aortic arch in which two aortic arches form a complete vascular ring that can compress the trachea and/or esophagus. Embryologically, the aorta's right sided 4th arch failed to regress which resulted in this double aortic arch and vascular ring. Depending on how tight the ring is, symptoms in infancy are related to respiratory compression, compared to a later presentation in childhood or adulthood of swallowing difficulty. 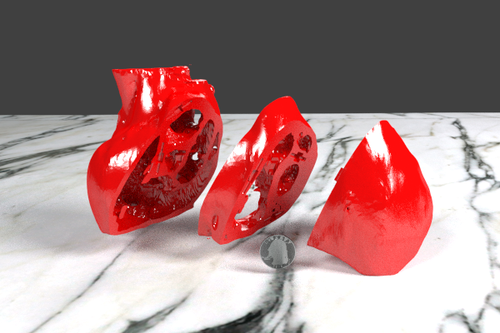 Please see the related STL file for 3D printing double aortic arch blood pool model. There are 3 separate files so the heart can be printed in slices. A fourth STL files is for 3D printing the whole heart model. The three part model has holes for magnets, which can be used to connect and separate the pieces. A US quarter is shown for scale in the images below. Normally there are two main blood vessels leaving the heart: the aorta, carrying blood to the body, and the pulmonary artery that branches immediately to carry blood to each lung. Instead of having a separate pulmonary artery and aorta, each with its own three-leafed valves, a baby with truncus arteriosus has only one great blood vessel or trunk leaving the heart, which then branches into blood vessels that go to the lungs and the body. This great vessel usually has one large valve which may have between two and five leaflets. Usually this great vessel sits over both the left and right ventricle. The upper portion of the wall between these two chambers is missing, resulting in what is known as a ventricular septal defect (VSD). There are 3 separate files as well as a fourth STL file for 3D printing the whole model. The three part model has holes for magnets, which can be used to connect and separate the pieces. All the STL files have been zipped to conserve space. It is distributed by Dr. Bramlet under the Creative Commons license Attribution-NonCommercial-NoDerivs. Please respect the terms of the licensing agreement. A US quarter is shown for scale in the images below. Ventricular Septal Defect or VSD is a hole in the wall separating the two lower chambers of the heart. Ventricular Septal Defect is a common heart defect that's present at birth (congenital). In normal development, the wall between the chambers closes before the fetus is born, so that by birth, oxygen-rich blood is kept from mixing with the oxygen-poor blood. When the hole does not close, it may cause higher pressure in the heart or reduced oxygen to the body. A small ventricular septal defect may cause no problems, and many small VSDs close on their own. Larger VSDs need surgical repair early in life to prevent complications. These STL files are derived from a Magnetic Resonance Imaging (MRI) of a 3 year old girl with complex perimembranous to muscular VSD with band dividing it into a large anterior component and smaller posterior component. There are 3 separate files as well as an STL file for 3D printing the whole model at once. The three STL files have been zipped and available for download. Alternatively, one STL file representing the whole model is also available for download. The three part model has holes for magnets, which can be used to connect and separate the pieces. Transposition of the great arteries is a serious but rare heart defect present at birth, in which the two main arteries leaving the heart are reversed (transposed). Transposition of the great arteries is usually detected either prenatally or within the first hours to weeks of life. Transposition of the great arteries changes the way blood circulates through the body, leaving a shortage of oxygen in blood flowing from the heart to the rest of the body. Without an adequate supply of oxygen-rich blood, the body can't function properly and a child faces serious complications or death without treatment. Corrective surgery soon after birth is the usual treatment for transposition of the great arteries. There are three STL files available for download segmented as seen in the video and images. These files have been zipped to save space and data transfer. The model is provided for distribution on Embodi3D with the permission of the author, pediatric cardiologist Dr. Matthew Bramlet, MD, and is part of the Heart Library. We thank Dr. Bramlet and all others who are working to help children with congenital heart problems lead normal and happy lives. Pulmonary atresia is a form of congenital heart disease, in which the pulmonary valve does not form properly. The pulmonary valve is located on the right side of the heart and regulates blood flow to the lungs. This defect prevents blood from flowing into the lungs to gather oxygen. Pulmonary atresia is often associated with patent ductus arteriosus and can occur with or without a ventricular septal defect. Symptoms, which usually occur within the first few hours of life, include cyanosis, fast breathing, fatigue, poor eating habits, and shortness of breath. The CT scan, from which the STL files are derived, is from a 3 week old infant suffering from pulmonary atresia, ventricular septal defect with confluent branch pulmonary arteries and patent ductus arteriosus (PDA). In addition, there is a right aortic arch with a tortuous PDA inserting into the right pulmonary artery as well as an atrial septal defect (ASD). The left subclavian artery originates first off the aorta with a common origin of the left and right carotid arteries followed by the right subclavian artery. Five STL files have been zipped and available for download. One blood pool model for extracardiac structural analysis, and four files for the myocardial segmentation. One file of the entire heart and then three files, (1,2 and 3) of the three slice method with the center slice aligning with a short axis slice and containing all valves. The heart model was designed to be printed in three slices and held together with magnets. This three-part 3D printed heart is from a CT scan of a 4-year-old infant with Tetrology of Fallot, a congentital heart defect and the most common cause of blue baby syndrome. It is characterized by stenosis (narrowing) of the pulmonary artery, an abnormal defect of the ventricular septum, an "overriding" aorta, and hypertrophy of the right ventricle. This patient has had a corrective surgery called Blalock-Taussig shunt. The three STL files have been zipped and available for download. Alternatively, one STL file representing the whole model is also available for download. The three part model has holes for magnets, which can be used to connect and separate the pieces. The magnets can be found on a site which specializes in rare earth magnets. A US quarter is shown for scale in the images below.